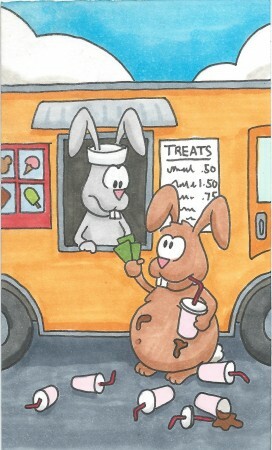 Fact: one milkshake is too many for a bunny. Of frozen foods and icy eats. “The same old thing? The same old way? That’s all I said to Ted, I think. Is all that Ted would ever make. I though: tomorrow, something new. He asked, but knew I never would. That any day, Old Ted would bring. “Please make something new”, to Ted. When Ted no longer came, alas. Previous Previous post: 1664 – I’m Melting!